Mazda's top selling vehicle, the CX-5 crossover, has been a blast to drive ever since they added a bigger SKYACTIV engine to the base two litre one a few years back. And since then, the Japanese carmaker has done nothing but make the vehicle an even more interesting and compelling drive. So it is that, for 2019, the company has chosen to not only add a new "Signature" trim level to the top of the line, it has also brought over the wonderful turbo four that now graces the CX-9 and is available in the exquisite Mazda6 sedan as well. The engine, especially, ups the fun ante appreciably, though a couple of unfortunate oversights mean the vehicle doesn't impart quite as much "driving joy" as it could. Mazda's largest bundle of joy goes into the 2019 model year with some new tweaks the company thinks will make this three row SUV/Crossover even more compelling than before. Tough to do that with a minor upgrade, especially since the CX-9 was such a terrific beast already, but the purveyor of Japanese "Zoom-Zoom" pulled a few rabbits out of their design hats for the new model year and they combine to make this big, three row SUV even nicer. It still needs paddle shifters, though. Zoom-zoom without paddles for the automatic transmission? Give me a break! It's amazing how the simple shot of oomph Mazda has added to its wonderful little MX-5 gives its driver an even bigger shot of adrenaline. Yet there it is: a car that has always been a joy to drive, yet has never been accused of being over powered, still isn't overpowered - but it's powered enough, and for this reviewer that's the best news since the demise of the turbocharged Mazdaspeed Miata of years gone by. I loved it! In fact, this new soft top MX-5 (why, oh why, can't they keep calling it the Miata?) is my favourite MX-5/Miata to date. And that surprised me. Compact SUV's are a dime a dozen, but if you're looking for one that's not only capable, roomy and efficient, but is fun to drive as well, the list gets decidedly shorter. Small and fun SUV's are available, but most of the lower end ones I've driven – the mainstream stuff from mainstream companies such as Toyota, Honda, Kia, Hyundai and the like – seem to focus more on the "UV" (Utility Vehicle) than the "S" (Sport), which is perhaps why the term "crossover" has become so popular. And while you can get small SUV's that are a blast to drive, you often have to look higher up in the automotive food chain, such as the Porsche Macan, BMW X1 and X3 and the like. What's person to do if he/she/it can only afford about $30,000 yet still loves the joy of the drive? Truth in advertising gets even more truthful for Mazda with the release of the 2018 6 sedan and its optional choice of a turbocharged engine. The engine, which comes from the company's big SUV/Crossover CX-9, ups the 6's entertainment/engagement ante substantially, which I imagine is the entire point behind Mazda's move. I've never driven a Mazda that didn't put a smile on my face (well, their old pickup truck was pretty ordinary, but that was quite a while ago), and even though I'd have preferred a bit more oomph from the current generation 6 when I first reviewed it back in 2013 I still liked the car and found it to be a rewarding driving experience. That 6 (and the current base model) uses the same Skyactiv 2.5 litre four cylinder engine that's found in the 3 sedan and the CX-5 SUV. And it's fine in both of them (though I'd love to see this more interesting turbo offered on them, too! ), but the larger 6 has more girth to pull around via its front wheels and that can affect the final "Zoom-Zoom" quotient. Hence the new turbo offering. The entry level version of Mazda's smallest SUV is not only a great vehicle that's a blast to drive, it also shows clearly that there are plenty of common features on today's vehicles that aren't really necessary. I mean, for 20 grand Canadian, you can have a gr eat-looking "crossover" that's also a great driving one (it feels kind of like a tall Mazda 3). It's almost enough to make me want to think about owning an SUV, without simultaneously ducking to avoid a lightning strike from Heaven. Here we go again, another Mazda review, another vehicle that does everything it should well, but which adds a little extra "zing" to the equation or, as Mazda has put it for so long, with "Zoom-Zoom." Sure, it could use a little more "Zoom," but it's still pretty good, and it's a darn fine mid-sized SUV as well. I love Mazdas and have only found one over the years I've been reviewing them that was lacking enough in "Zoom-Zoom" for me to whine about it - even though I'd love to see a little more of it in most of their current vehicle line. 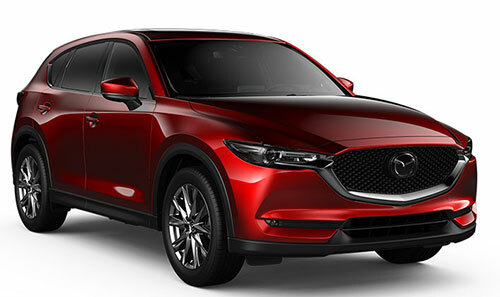 It was the original CX-5, back in 2012, the first Mazda product to offer its SKYACTIV technology. The two litre engine in question only put out 155 horsepower, which prompted me to quote the book of Daniel: "For what doth it profit a man, if he gain the whole world, and suffer the loss of his own soul?" My point was that I hoped Mazda, while attempting to appease the greenies with its SKYACTIV technology (which, to be fair, involves more than just their engines), didn't enrage their fans at the same time. I know they annoyed my best friend, who drives a first generation Mazda3 and is seriously looking at a new CX-5 for his next vehicle, because after he drove that original CX-5 he referred to it as "Snooze-Snooze," and he doesn't even have my lead foot. Ah, the Mazda MX-5. Once called the Miata, the Japanese carmaker's little open top roadster has been around for nearly 30 years and during that time has evolved and grown like most cars. But unlike some cars that get overstyled or "over-teched" or which lose their original mien over the years, Mazda has never lost the Miata's focus of delivering the kind of driving joy that used to be found on such cars as the MGB, but without leaving you on the side of the road every time it rains. It turns out that the phrase "Wankel rotary engine," unlike how it's described in an old Monty Python sketch, is no reason for embarrassment. Especially for Mazda, the only carmaker with the pluck to realize - and do its best to prove - that Wankels weren't just for wankers. Sure, it hasn't worked out as Mazda may have liked - the last rotary Mazda was the now-defunct RX-8, a terrific sports car - but it isn't as if the technology doesn't work. It just may not work as well as the conventional internal (a.k.a, to greenies, as infernal) combustion engine, especially in this day and age of increasingly mandated fuel economy. It's big and it only sports a four banger engine, but the Mazda CX-9 SUV/crossover is one of the best driving vehicles in the class. In other words, it's a typical Mazda. Mazda is a relatively small car company, and for the last few years the Hiroshima-headquartered Japanese carmaker has had to forge its own path without another carmaker having its back (Ford used to be a partner). Yet it consistently comes up with vehicles - sedans, SUV/crossovers and, of course, sports coupes - that are just plain fun, yet are also featured fully and exude an air of quality that makes them seem more expensive than they are. The bad news is that you can no longer get a V6 engine in Mazda's biggest SUV. The good news is that you may not care. I must admit that I was worried when I heard that Mazda was dumping the V6. I liked the old CX-9 a lot - I have yet to drive a Mazda I didn't like - and I was concerned that trimming it down to a turbocharged four cylinder engine would lead to a vehicle that wouldn't be as much fun to drive. But I needed have worried! After spending a week in the new CX-9, I commend Mazda for their choice because the new CX-9 loses nothing important in the way of performance, yet it shed weight and undoubtedly upped its fuel mileage in the process. Hot on the heels of Honda's Civic being named the 2016 Canadian Car of the Year comes the news that Mazda has copped the crossover cup, beating out utility vehicles costing more than twice as much. That's a pretty neat trick, and I agree completely with my fellow members of the Automobile Journalists Association of Canada in their assessment. In fact, I called this one right after last fall's TestFest, which must be a record since I'm usually proven wrong in such prognostications. Chalk up another hit for the "Zoom-Zoom" folk, if there's any justice left in the world. That's because Mazda's brand new CX-3 SUV/crossover is a terrific vehicle that should compete well in its market niche. It's a fun little beastie that, like most Mazdas, is a relative blast to drive. Mazda6 gets a 2016 update but same "Zoom-Zoom"
After debuting to much hullaballoo from enthusiasts, the Mazda6 sedan has soldiered on in near anonymity in its current generation - I see oodles of 3's on the road but it's rare to see a 6 around here, and that's a darn shame because the 6 is pretty well everything the 3 is, but bigger (though no hatchback or V6, alas). Last year's award-winning Mazda3 enters 2015 mostly unchanged, and that's just as well because the 2014 version was an outstanding car that needed little work. Heck, I named that car my "TechnoFile Car of the Year" last year. This rant recounts my rematch with the Mazda, a report on how my second week-long experience with this great little hatchback/wagon worked out. Naturally, it worked out fine. Heck, I didn't even run afoul of the law this time! Mazda MX-5 still a blast - but at what cost? Mazda's little bundle of joy has been putting smiles on enthusiasts' faces for more than 20 years, and it's still about the best iteration of the classic British sports car you can get without being left on the side of the road. The car was an instant hit and since then has gone on to sell more than 900,000 units, which Mazda claims makes it by far still the best-selling two-seat roadster in the world. Mazda's bread and butter car, the 3 (click on the image to open a slideshow), is back with a terrific new edition that ups the already successful little car's ante substantially over its previous generation. It's an excellent car that looks, drives and feels more expensive than it is. The 3 is available in two versions, sedan and hatchback, which Mazda calls, respectively, the Mazda3 and the Mazda3 Sport. They're both very nice, but the Sport is a five door hatchback (a.k.a. a "wagon"), so it's also a tad more practical for those who like to haul stuff. Mazda's MX-5 is all about the driving experience and it does a fine job of carrying out its mandate. When Mazda single handedly resuscitated the two seat roadster segment, the little roadster hearkened back to such classic sports cars as the MGB, Triumph Spitfire, Alfa Romeo Spyder and Fiat 124 Spider. Except that Mazda upped the ante by adding to the fun factor the reliability for which Japanese carmakers had become known. The rest is history: a beloved segment was reborn. Since then, the MX-5 Miata became simply the MX-5 and went through some evolution that has left the car larger and heavier, equipped better, but still an absolute blast to drive. And they even added an optional retractable hard top that buttons the car up as tightly as a coupe – remarkably, without truncating the trunk. The Mazda6 is back, wearing a brand new set of clothes and with a new heart as well. And it's a great new version, even in its four cylinder Skyactiv livery. It's a good thing the four cylinder's such a delight, too, because Mazda no longer offers a six cylinder option. I think that's a mistake, but at least the configuration is entertaining enough not to water down the "Zoom-Zoom" quotient excessively. Call one an important upgrade, the other a minor update. And between them both, you have a couple of very nice SUV's. The CX-5, Mazda's entry-level SUV, came out last year as the first of the company's "Skyactiv" vehicles, which are designed to up the gas mileage substantially while supposedly not minimizing the "Zoom-Zoom" for which the company is rightly famous. It was handsome, pretty good to drive, and it did get better mileage than may have been traditional for a Mazda. But despite its plentiful goodness, I thought it was underpowered and therefore a disappointment. And that was a surprise; I was a big fan of the turbocharged CX-7, which the CX-5 replaced, and I'm a big fan of Mazdas in general, exactly because of "Zoom-Zoom" – they're generally a lot of fun to drive. Mazda3 Sport SKYACTIV: great car, still with "Zoom"
Mazda's "SKYACTIV" technology is designed to up gas mileage and lower emissions while preserving the company's well-earned "fun to drive" quotient. And while those two goals may seem contradictory – or as unobtainable as perpetual motion – Mazda has done a pretty decent job with its top selling 3. First introduced with the 2012 model year, SKYACTIV technology is described by Mazda as "the next generation of advanced vehicle performance and efficiency" that "embodies Mazda's philosophy of engineering only vehicles that are fun to drive, satisfying to own and environmentally responsible." I've dumped on SKYACTIV before, especially when it came to the CX-5 crossover/SUV, which I found lacking in "Zoom-Zoom" when I drove it several months ago. They may be very different in form and market niche, but the Mazda MX-5 and Toyota Venza are both excellent vehicles that offer a lot of value and/or fun to their owners. And that's nothing to sneeze at. Mazda CX-5 – Economy and Style, Hold the "Zoom-Zoom"
They're both big, three row SUV/Crossovers, from Japan, and both sell for about the same price. But are they mostly the same, or are they two distinct variations on the theme? Clearly, just to look at the two vehicles you can tell it's the latter, that each of these big family haulers is its own man, so to speak. The Mazda comes across as, well, "Zoom-Zoom," but it's also more stylish than the rather boxy Pilot – not that beauty is anything other than in the eye of the beholder, of course. The Honda appears clearly as more utility-oriented than the CX-9, with nifty storage areas throughout and a much more "workman-like" mien. You might think Mazda using a word like "SKYACTIV" to describe its products might mean it has come up with a practical flying car. You'd be wrong, of course – not that Mazdas can't fly along the road in their own right. They do, after all, offer "Zoom-Zoom." Mazda's MAZDASPEED3and MX-5 are definitely a couple of "Zoom-Zoom" treats for fine, summer driving. And what could be more fun than that after a seemingly endless winter and wet spring? Mazda's largest sedan continues to be a compelling drive as it reaches about the middle of its life span. The Mazda6, like the Toyota Camry, Hyundai Sonata and about a thousand other models, actually occupies the "mid-size" rather than the "full-size" niche – and is, in my never humble opinion, one of the most attractive sedans on the market these days. It's not only easy on the eyes, though, it also performs its function as a practical four door family car very well. Mazda CX-9 "Crossover" SUV – Big and Comfy, with "Zoom"
They've upgraded its looks and features a bit for 2010, but at heart the Mazda CX-9 is the same big SUV it has been since its introduction. And that's a good thing. Not a lot needed to be changed. Heck, my chief complaint is that they still use red illumination on the instruments, and that is not only about as minor a beef as you can have, but whether or not it's even a beef at all is something clearly in the eye of the beholder. Mazda CX-7 and Mazda6 – Can Less Zoom-Zoom Be a Good Thing? Can downsizing a vehicle's specs supersize its appeal? Mazda hopes so. Mazdas are a blast, even if you don't go beyond their most basic entries. And if you do go beyond – to the fabulous MX-5 roadster, for example – it's a blast heard around the world. 2010 Mazda 3 - Long Live "Zoom-Zoom"! You certainly can't accuse Mazda of false advertising for using "Zoom-Zoom" as their slogan. The phrase captures the Mazda driving experience beautifully, whether you're behind the wheel of the RX-8, MX-5 Miata, the CX-7 and CX-9 crossovers or, the topic of this piece, the little Mazda 3. The previous 3 was a huge success for Mazda. According to them, it sold nearly 1.8 million vehicles in over 100 countries since its 2003 launch and won more than 90 automobile awards, including the 2004 "Canadian Car of the Year". Which is better, luxury performance, or classic "Zoom-Zoom"? Or perhaps more accurately, which of these popular SUV's turned my crank the most after spending back-to-back weeks with them: the Acura RDX or Mazda CX-7? Mazda 5: A little Van with a little "Zoom-Zoom"
Other than some tweaking of options, Mazda’s little six seater hasn't changed much for 2009 – and that may be 'cause this miniature minivan didn't need much changing anyway. New Sedan Ups Mazda's "6 Appeal"
One of the best looking and most fun to drive Japanese sedans is even better for 2009. Mazda MX-5 Tops Its Own Act! It's big, it's comfy and it's roomy. Oh yeah, it's also a Mazda and that means it's pretty nice to drive. No matter what flavor you choose for it, Mazda's 3 is a slick little car that offers a lot of fun wrapped up in a lot of practicality. Once it was called the Miata, and it turned the automotive world on its ear. The little two seat roadster took all that had been great about open top motoring as personified by the classic British sports cars and added new technology and the legendary dependability of Japanese cars. It was an instant hit and has continued to be a wonderful and popular fun-mobile ever since then. Mazdaspeed 6 – Family Sedan or Road Rocket? Take one of the best looking four door sedans on the market, add a turbocharger and a bunch of other tweaks and what do you have? Very nearly driving heaven, if sporty performance is the Holy Grail for which you’re searching. MAV is yet another in a long series of acronyms or nicknames companies use, perhaps to avoid the “soccer mom” image minivans and other utility vehicles have gotten over the years. Well, is my face red. For a happy reason: a week spent under the hot summer sun behind the wheel of Mazda’s turbocharged Mazdaspeed MX-5 Miata. I spent so much time roaring around the back roads with the roof down that I ended up being broiled medium well, which for a guy who doesn’t go outdoors except to drive cars, is quite something. And, other than the sunburn, I loved every minute of it! Well, they certainly arent kidding. I mean, Mazdas zoom zoom slogan can be applied in the real world to the experience of driving such fun cars as the Miata and even the 6 sedan. But take it to its ultimate expression and you have to be talking about the RX-8, the latest generation of the companys rotary-powered sports cars and an absolute blast to take out on the highway. Can a station wagon be cool? Can it be sporty? You bet! The days of a station wagon being a stodgy family hauler are long gone and some of todays wagons are wonderful blends of function with form. Take the Mazda 6 Sport Wagon, for example. The Mazda 6 has been winning awards ever since it was introduced for the 2004 model year, and the new wagon version copped the 2005 AJAC (Automobile Journalists Association of Canada) Car of the Year Award for Best New Station Wagon. I can see why. The 6 Sport Wagon is a blast to drive  and you can haul stuff with it, too! In a market segment that features such venerable Japanese entries as the Honda Accord and Toyota Camry, carving out a market share is going to require more than just a great car. It has to be a great car that's different from its direct competition. Mazda's "cute ute" Tribute is a nice small SUV with good performance both on and off the road, plenty of features, and good value overall. I first had a chance to drive the Tribute when it debuted, at a media event where they sent us out off roading up a "road" I probably wouldn't have even tried walking up if given my druthers. That experience showed me that the Tribute is truly happy to perform off road as on city streets. The Mazda Protegé is far more fun to drive than it has any right to be. After all, its Mazdas entry level vehicle, a supposed econobox that competes with the likes of the Honda Civic, Toyota Corolla, Hyundai Accent and the rest. Yet when you get behind the wheel and take off, even if the cars handicapped by an automatic transmission as my tester was, you find yourself having a really good time driving the thing. Go figure. Mazda's Protegé 5 is a definite success story. After having driven a bumblebee-colored sample when the car was brand new on the market, I was very impressed and figured the car would sell boatloads. And it has; it's hard to drive very far near where we live without seeing multiple examples of the little wagons zoom zooming around. And deservedly so; Protegé 5 is a nice car. The brand new 2002 Protegé 5 is a cute five door hatchback/station wagon that appears to be aimed at the youth market. How do I know? Well, the bright "vivid yellow" model I drove, which came complete with black racing stripes running its length (giving the overall impression of a giant bumblebee), pulled in more stares per mile than any vehicle I've driven recently, and most of the admiring gazes came from teen and twentysomething females. Mazdas first time at bat in the SUV market has resulted in a home run. The Tribute feels as at home on the mountainside as on the city streets. I know this because, while the weather (and my nerves) didnt allow for any off-roading during my week and a half with the 2001 Tribute ES, I had the opportunity to go four wheeling in one at a media junket last fall. Any car that's this much fun must somehow be bad. But Mazda's MX-5 Miata sure feels good! The Miata has been around for over a decade, and has almost single-handedly re-carved the niche made famous by those honored British sports cars of decades past. Except the Miata has the advantage that it not only gets you where you're going, IT GETS YOU BACK AGAIN! Mazdas newly-styled 2001 Millennia is a comfortable luxury sedan that offers a lot for the price. I first drove the Millennia for about half an hour at a media junket, and I liked it. I had it for a week this time, which gave me a much better feel for the vehicle. It's the first of three Mazdas I'll be driving over the next few weeks and, from my experience with the Millennia, it should be a treat. The handsome and stylish Millennia S (my tester was a lovely metallic red with a beige/gray leather interior) is powered by a 210 horsepower, 2.3 liter, 24 valve DOHC V6 that uses Miller Cycle technology. The base model Millennia has a more conventional, 2.5 liter V6. Patented in the 1940s, the Miller Cycle is said to give the power of a 3 liter V6 with the fuel economy of a 2 liter. It uses a Supercharger (which forces extra air into the engine) and compresses the air inside the cylinders differently. The result is said to be a 15 per cent increase in power. I can't attest to the fuel mileage (I tend to have a heavy foot) but the powers certainly there. It's smooth, too, coming on quickly and evenly; from a standing start I'd be at 50 m.p.h. before I knew it. The minivan market is nothing if not crowded, so it pays for a marque to offer something unique if it wants to make its mark. Fortunately for Mazda, it has never been reluctant to tread its own path, as witnessed by its embrace of such non-mainstream stuff as (for example) the rotary and Miller engines. Mazda has finally jumped into the SUV market. The Japanese carmakers first Sport Ute is the 2001 Tribute and, judging from the test drives in which I participated, its a fine unit thats surprisingly apt off road. A Mazda media junket to Vancouver, British Columbia, to premiere its 2001 model year lineup was my first opportunity to see the Tribute up close, and I was quite impressed.